Vikram ran to the tree and pulled Betal down. As he began to carry Betal, Betal began narrating another story. Once there were two brothers who were very fussy. The first brother Gopal was fussy about his food; the second one Deepak was fussy about where he slept. Gopal would eat only very good and selective food and Deepak could sleep only on a very comfortable bed. Their fussiness was so famous that one day the king called them to find out who was fussier of the two. Gopal was given the best quality rice to eat. But he refused to eat it saying that the rice smelled of a cremation ground. On investigation it was found out that the rice actually was grown on a field next to a cremation ground. When it was Deepak's turn, he was given a bed with seven soft mattresses on it. But he could not sleep all night. In the morning he had a rash on his back. He said that there was something under the mattresses. On investigation it was found that there was a hair under the seventh mattress. 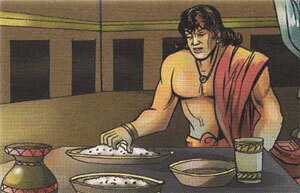 Betal asked Vikram, "Who was the fussier among the two brothers?" Vikram replied, "Deepak was fussier because the rash was a physical proof of his discomfort. While there was no such proof in the case of Gopal . Who knows he could have asked someone about the rice?" Betal was surprised and said, "How do you manage to give the correct answer to every question I ask? But you opened your mouth, so here I go." Saying so, Betal flew back to the tree.